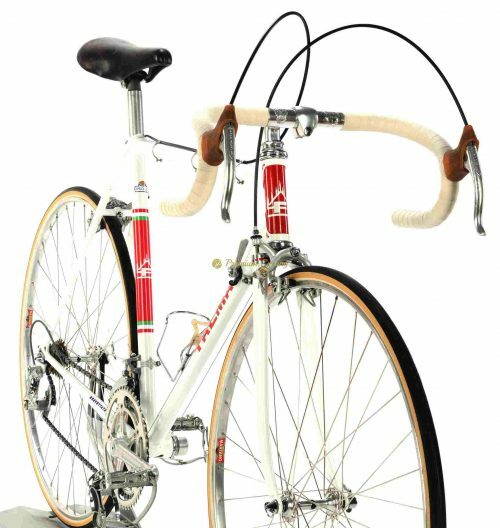 Giuseppe Pela was a master frame builder from Torino, affirmed in Italian cycling history as a guarantee of traditional craft with the passion for a totally custom approach. The 1960s and 1970s represents the golden age of Italian cycling and Pela embodied the values of frame building worlwide. Between the late 1950s and early 1970s, he built frames for a numbers of pro riders including Merckx, Anquetil, Van Loy and Bobbet. Aside that he was also building for famous brands like Gios Torino, Masi and Benotto. Pela never put his own name on any frame, probably to not interfere or conflict with the business interests of the teams and riders he built for. Instead of “signing” his works with his name, he mark the frames with special marks which make every Pelà frame recongnisable amongst experts. So the typical Pelà signs are the four cut-outs under the BB shell and the slots with a point in the middle on the fork crown. 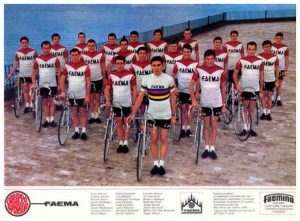 Faema – Faemino was a Belgian cycling team, sponsored by FAEMA (Italian coffee machine manufacturer) with Belgium and Italian riders on board. One of the riders was also famous Eddy Merckx who won his first Tour de France in Faema jersey. Giuseppe Pela built frames for almost entire Faema Team back in 1969-1970. Proudly presenting another iconic Italian racing machine made by Giuseppe Pela. 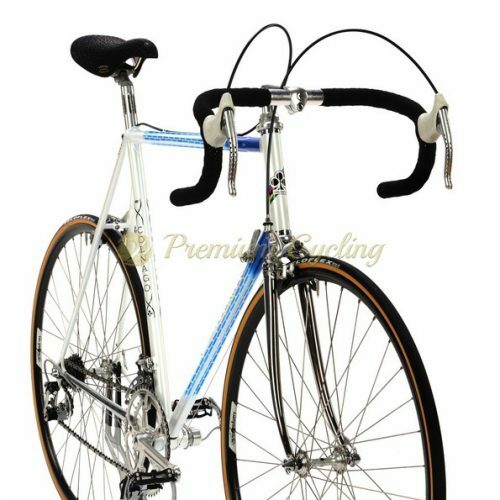 The frame is work of art, shinning in famous Faema Team paintjob, made of Columbus SL tubing and featuring the perfection and attention to details to providing the best performance you might expect from late 1960s/early 1970s steel machine. Only the best and period correct parts are good enough for such a racing machine: Campagnolo Nuovo Record groupset (1969-1970), Cinelli cockpit, Cinelli Unicanitor saddle, Martano rims. Love at first sight, no much words needed. The legend. Ready for L’Eroica event. Condition: The frame was completely restored and repainted by professional guy. No cracks, no dents, not bent. Groupset is in good condition. All parts are working fine.